Yes its the time of the year again…a time for reflections, a time for revelations and a time for new resolutions. As the end of the year draws near, one can’t help but look back at what has happened over the last 12 months. This is the time of year when people relax, unwind, preparing for the holidays and festivities to come. However, this is also the time of the year when the rains visit us again, the skies are grey half the time and sometimes, our moods follow as well.One of life’s many ironies. Today we celebrate the winter solstice, 冬至. This is an important day on the Chinese lunar calendar as it marks the coming of winter proper. This is when families prepare themselves for the harsh cold to come. However, Singapore knows no seasons. 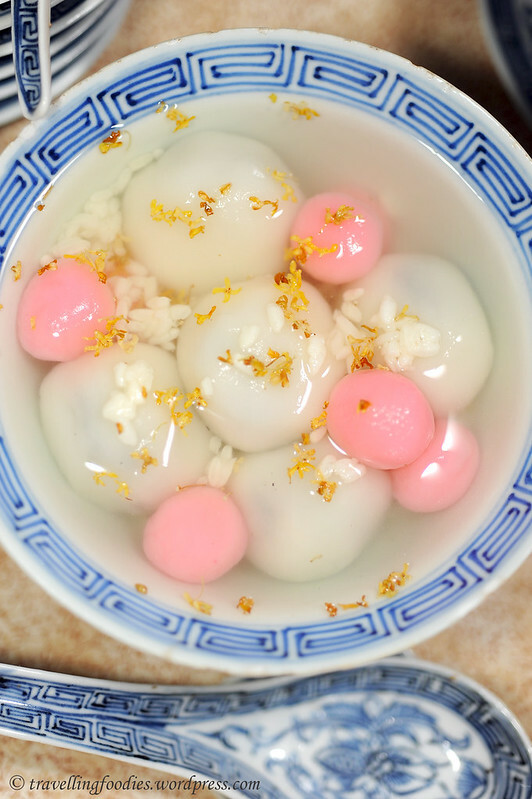 But my family, being rather traditional, celebrates the day with offerings to the gods, most symbolically in the form of tang yuan, 汤圆 glutinous rice dumplings. When we were young, preparation started early in the morning, as my mother would knead the dough from scratch as my sister and I pinched off pieces from it, rolling them into balls, getting ready to dunk them into a hot pot of boiling water. Another pot looked on, exuding a sweet jaggery and gingery aroma from the broth that was bubbling along. 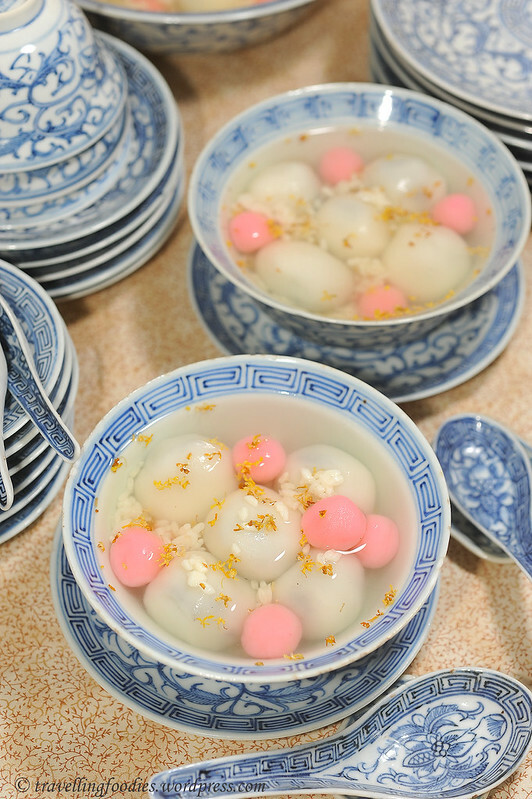 Being Hokkiens, we enjoy tang yuan in hot ginger broth sweetened with raw brown sugar. My mother accentuates that we daun pandan. I remember being told by my grandmother when I was young that we had to eat the number of tang yuans (kueh ee she called it) in accordance to our age! Her little “ploy” to make us children eat more I guess! Technically speaking, we aren’t allowed to make offerings with tang yuan this year. My mother passed away last year, so in accordance to Chinese customs, my family is suppose to “keep everything low and quiet” for the subsequent three years of mourning. But I missed the times when I made tang yuan together with my mother. 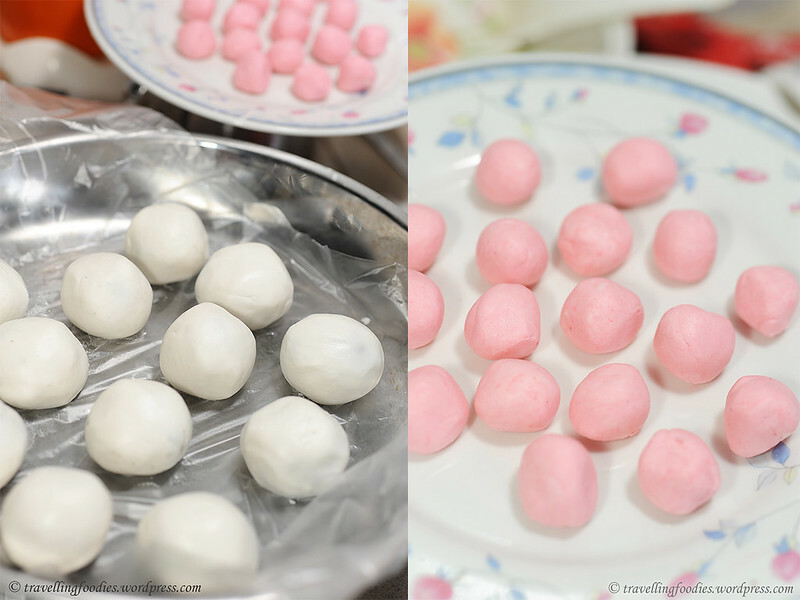 Despite not using them as offerings later, I prepared some nonetheless, to revive those wonderful memories of my mother and I making tang yuan together. The version I’d prepared is not what we are accustomed to preparing in the past. Instead, it is a version which I’d enjoyed thorough my numerous trips to Taiwan. It uses sweet fermented glutinous rice a major component, providing much of the flavours and aroma in this sweet dessert. The sweet glutinous rice is basically residual to glutinous rice wine making. This lends a lingering and intoxicating alcoholic presence, albeit in a very pleasant way. 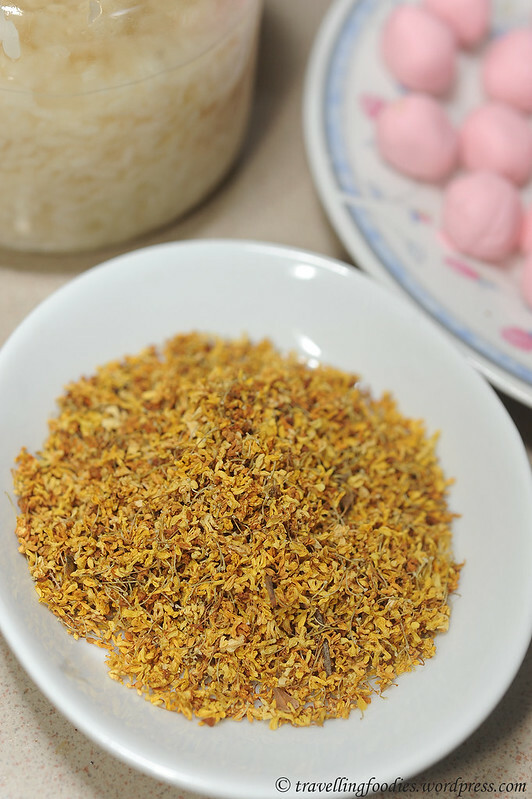 Aromatics are further elevated through the use of dried osmanthus blossoms. Really really lovely. 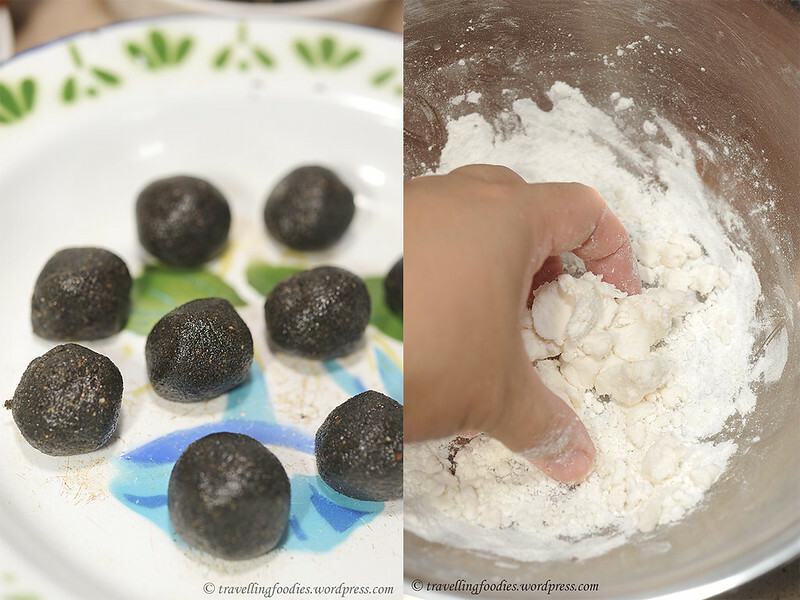 I remember making tang yuan filled with black sesame paste when I was young, when my grandmother was still around. But as we grow older and our lives got busier, we settled for more hassle-free store-bought frozen ones instead. I’d decided to make my own this year. The first thing I need was a working recipe but since my grandma and mother had both passed on without me learning the ways of making it properly from them, I only have one more person left to turn to, my aunt whom I remembered to be part of the “dumpling making team” many years ago. I have her thank for allowing me to relive our family’s orh kueh recipe as well. While the seeds are still warm, blend them with a food processor until coarse grain. Add sugar and continue to grind under powder form. Add butter and continue to beat until fully combined into a paste. 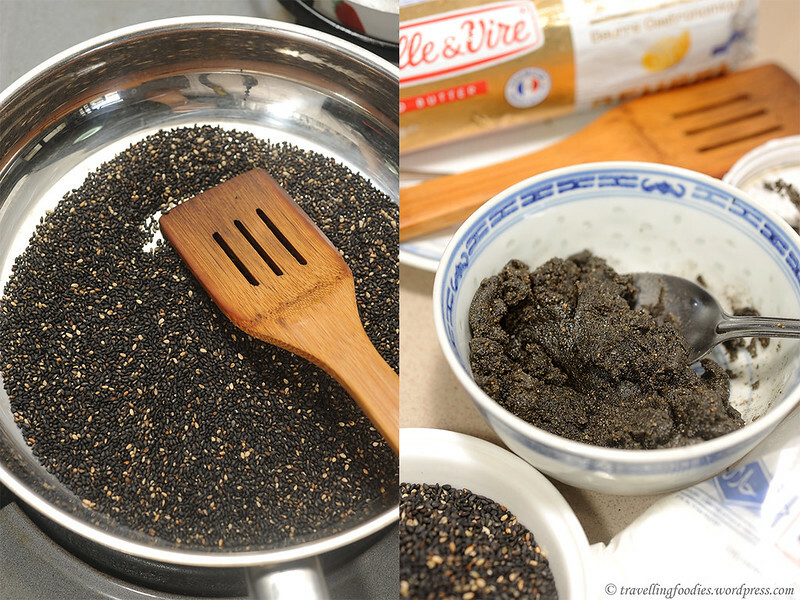 Divide the black sesame paste into 10 equal portions. Roll into balls and place onto a tray. Refrigerate to firm up for later use. 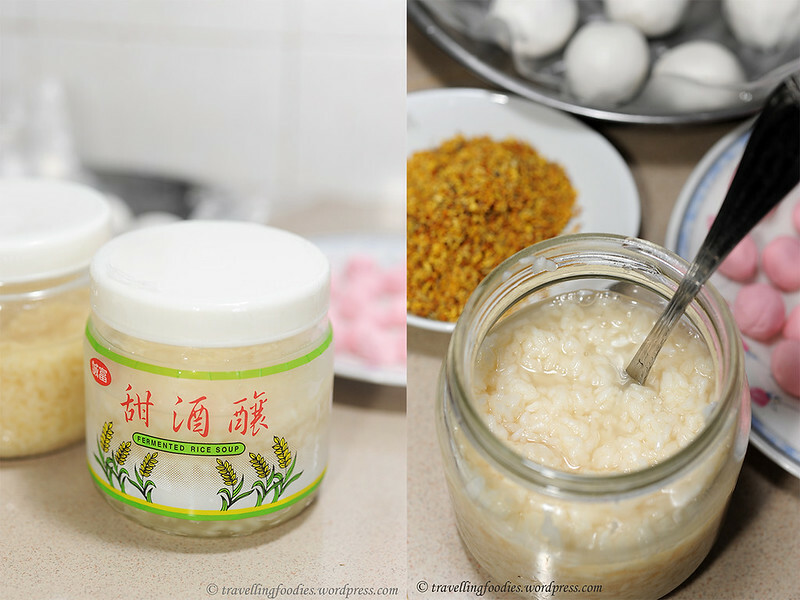 After washing hands thoroughly, prepare dumpling skin by first adding a portion of tepid water to glutinous rice flour in a large bowl and mixing well to incorporate. Gradually add more water until “play dough” or “soft clay” texture is acheived. Divide the dough into 10 equal portions and roll into balls. 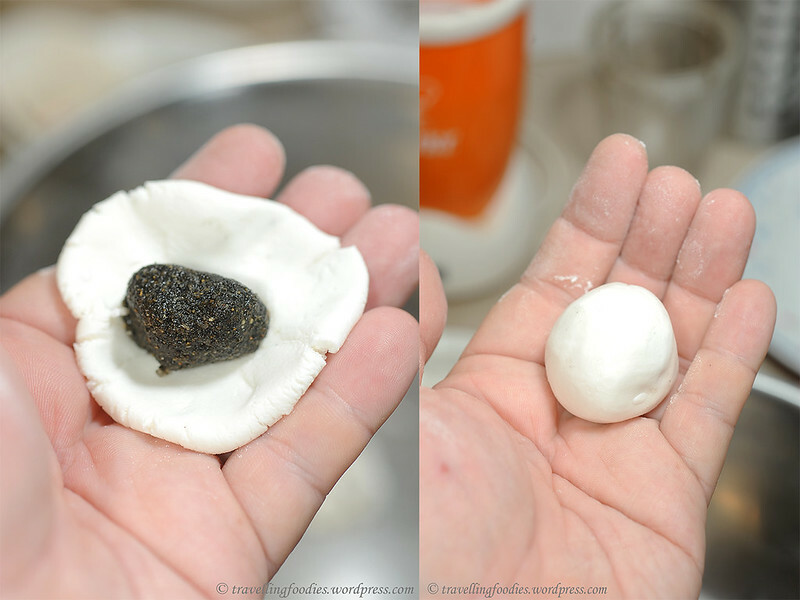 Carefully wrap the dumpling skin around the black sesame paste without breaking the skin. Seal the edges tightly to prevent the paste from leaking during cooking. Place the rolled dumplings onto a plate lined with a plastic sheet. 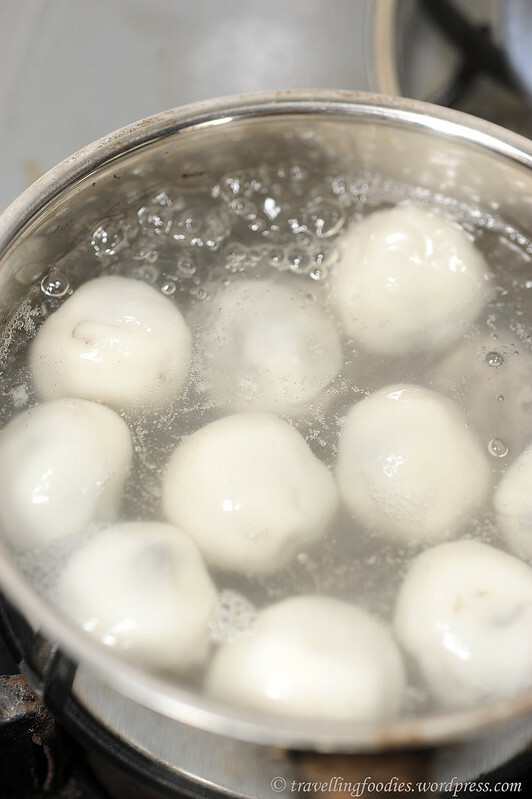 Cook the tang yuan in a pot of simmering water. Remove when they stay afloat and transfer them in to a bowl of water. Bring a pot of water to boil. Add sugar and stir to dissolve, followed by dried osmanthus. Stir until sugar completely dissolves, turn off flame and cover with lid to steep. After 10 min, add sweet fermented rice and stir thoroughly to incorporate. 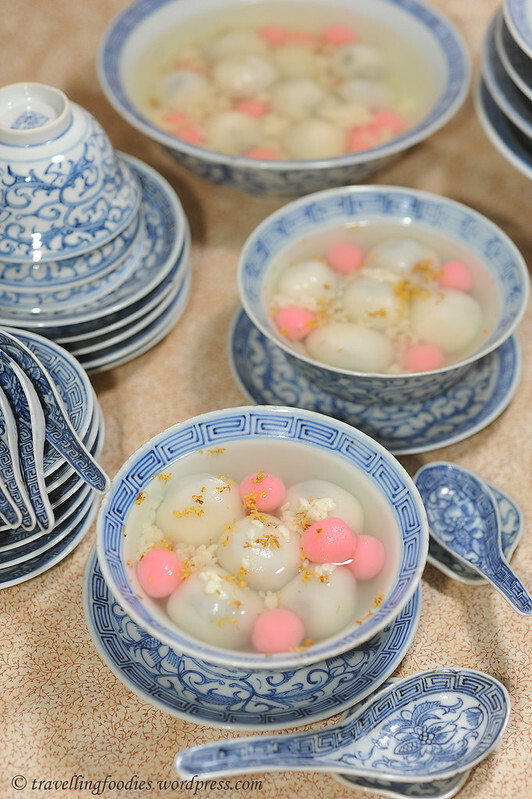 To serve, simply place a couple of tang yuan in a bowl and ladle hot sweet broth over it. Serve immediately. To make the paste filling more fluid (流砂), I Was told to either add a bit of water to the paste or simply increase the amount of butter by another 5g or so. Well, since it is the first time I’m making it, I wasn’t gonna be too adventurous… not at this moment anyway. The proportions of flour to water given is an estimate, as it really depends on the moisture level and absorbancy of the flour used. As a guide, the final dough should be easily pliable and yet not sticky, neither to the hands or the bowl which it was formed in. As with all types of dough involving water, “less is more” as one can always increase when not enough, but very difficult to reverse the situation after adding too much. That said, do have extra flour to remediate times of such. The sweet fermented rice should be added only after the flame is turned off. This helps to retain any precious remnants of sweet rice wine within. 酒釀 is supposedly very good for ladies, though pregnant mothers should avoid it due to the alcohol content. In a popular variation, a beaten egg can also be added to the broth after turning off the flame, creating an egg drop soup albeit sweet. This supposedly increases the nutrition value of the whole dish! Immensely popular way of eating in Taiwan. Notice that the proportions of water and sugar is not detailed in the recipe. Well, it really depends on how much soup you yearn to drink or simply how sweet or alcoholic intoxicating one wishes to enjoy. This is really more of a case of personal preference, which no recipe can possibly standardised. This entry was posted on December 21, 2012 by Alan (travellingfoodies). 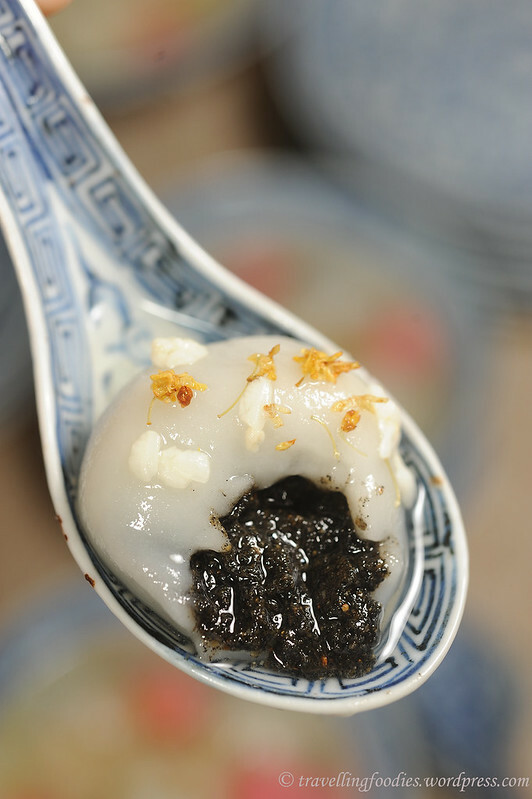 It was filed under Food, Simple Eats and was tagged with black sesame, chinese traditional festival, dong zhi, dumplings, 酒釀, 芝麻, fermented sweet glutinous rice, glutinous rice flour, osmanthus, Tang yuan, winter solstice, yuan xiao, 元宵, 冬至, 桂花, 汤圆, 丸子. Just curious, why is it not advisable to use fingers to place the sesame paste onto the dough? I’m guessing that it will melt the paste due to the body heat? Also, could you advise me where to get the sweet fermented rice in Singapore? For sweet fermented glutinous rice, you can try the provision shops at the basement of Chinatown wet market. Hi Alan, thanks for enlightening me. 🙂 I’m going to lay my hands on some 酒酿 soon and try this out. May I know where you bought the dried osmanthus blossoms? Thank you. you can buy them at chinese medical halls.